Nobody fixes more hot water heaters then SoCal Plumbing & Rooter. Whether you need tankless or gas water heaters repaired we can help. We offer installation, sales and repair service. 20 year plus experience working with all types of water heaters. Call the local plumbers right here in Whittier, CA. 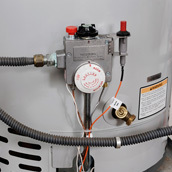 Along with detecting and repairing the pipelines, we also offer repair services for water heaters. No matter which makes and model of water heater you have, we can fix it within a short time. Our technicians are highly experienced, and they know how to fix the issues quickly and get the heaters repaired in no time.